ARCATA – Activist and former City Councilmember Dave Meserve is spearheading a new grassroots effort to eliminate from the law the idea that business corporations enjoy the same rights as human beings. On Jan. 31, Meserve turned his proposed ballot initiative in at City Hall. A Ballot Title and Summary is expected from City Attorney Nancy Diamond by Feb. 16, with a published legal notice to follow. To get on the Nov. 6 Arcata ballot, Meserve will have to gather 1,066 signatures from registered Arcata voters, or 10 percent of the total number of Arcatans registered. The signatures must be turned in by April 30 at 5 p.m. The measure will be formally announced at a press conference, and Meserve said he expects to start gathering signatures by Feb. 23 or 24. 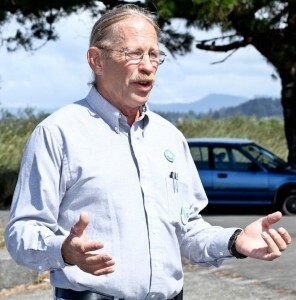 Meserve said the Arcata ordinance is consistent with a nationwide uprising against corporations which are now pouring undocumented millions into political campaigns, thanks to the Supreme Court’s “Citizens United” ruling. A website for the campaign is under construction, but active: corps-aint-peeps.org. A Facebook page is also available by entering “Corps ain’t peeps” in the search window. 1. Corporations are not natural persons, and the rights protected by the Constitution of the United States are the rights of natural persons only. 2. Money is not speech, and the spending of money to influence elections is not protected speech. Within the City of Arcata, CA, corporations shall not have the rights of “Persons” or “The People,” as guaranteed by the Constitution of the United States, the Bill of Rights and the Fourteenth Amendment. Only living, breathing human beings shall have such rights. This entry was posted on Friday, February 10th, 2012 at 7:41 am	and is filed under News, Business. You can follow any responses to this entry through the RSS 2.0 feed.